The mango is native to southern Asia, but grows around the world in many tropical and subtropical climates. It has become one of the most widely cultivated fruits in the tropics. Though there are an estimated 400 varieties of mango, only a few types are suitable for dehydration. Depending on the region, some popular varieties include: Kent, Keitt, Haden, Ataulfo, Kaew and Chokanon. Packed with fiber, mango is rich in phenols (antioxidants), iron (for healthy blood), selenium (to fight heart disease), calcium (for strong bones), and are verifiable vitamin powerhouses. 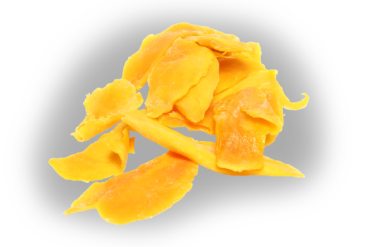 While dried mango is commonly enjoyed simply as a deliciously sweet and chewy snack by itself, it is now widely used in snack bars, fruit/trail mixes, and baking.